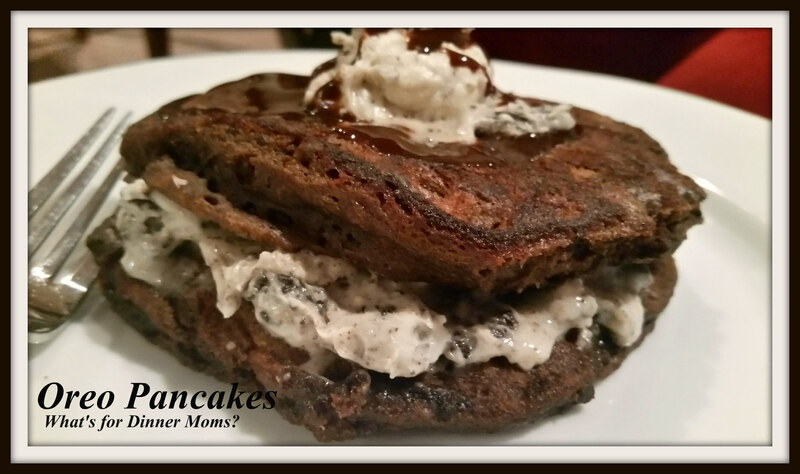 Oreo Pancakes – What's for Dinner Moms? I hope you know by know if you have read any of my prior posts we love fun dinners every so often. As I served this last night my son kept asking, “Is it dinner? Is it dessert? Can it be breakfast?” I say yes to all of them! These are rich, hearty pancakes. All of us, except my 14 year-old son, couldn’t finish the two served with the frosting. We made them with about 1/3 cup of batter each. You may wish to use about 1/4 cup. Serve them with a side of fruit salad to make yourself feel better about serving them for dinner if you like. In a large bowl mix flour, cocoa powder, baking powder, baking soda, salt and sugar until blended. Stir in buttermilk and eggs until just mixed. There will be a few lumps. Stir in Oreos to blended. Cook pancakes by 1/4 cup on a well-greased griddle over medium heat. Once they are cooked through place in 170 degree oven or the lowest temperature your oven will go. Make frosting by beating together butter, powdered sugar, and vanilla. If needed to thin add a splash of milk. Stir in crushed Oreos. To serve thinly frost one pancake placing a second on top. Drizzle with chocolate syrup if desired. Thank you! They are hearty and rich! Looks Delicious!!! I have a query. After cooking in griddle, it has to cook in oven for how long?? Thank you! No baking in the oven. Just keeping warm until serving. So easy & tasty! Thanks for sharing the recipe!